Tomato season is so over here in Central Texas. But boy oh boy do I have a craving. And the truth is you can buy tomatoes at your grocer that are actually quite good - even out of season. Buying tomatoes out of season may be blasphemous to some of my colleagues. And I understand but sometimes you must satisfy that craving. So here’s how I do it. This is actually a technique I’ve been teaching to students for years. The basic standard is, “If you buy out of season, in this case tomatoes, you’ll get the best flavor by roasting them”. And you get the best flavor by roasting because it brings out the sugars which in turn caramelize leaving you with a sweet harmony of flavor that’s irresistible. Ready for a perfectly roasted tomato? Clean tomatoes, pat dry, remove stem and slice lengthwise into 4 even pieces. 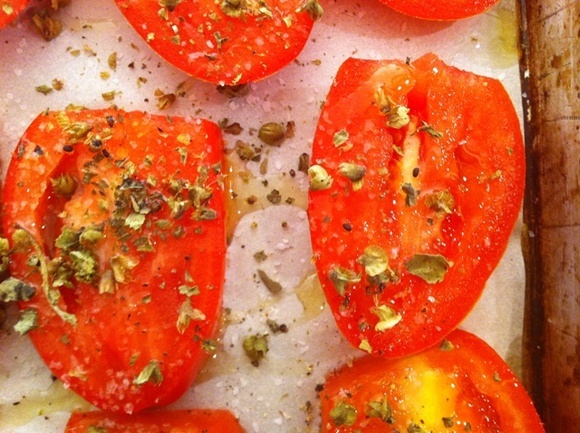 Take sliced tomatoes and place them on a parchment papered sheet pan. Be sure to use a pan that has a lip around each edge so that the tomato juices to not drip when cooking. Drizzle olive oil over each tomato slice. Sprinkle basil, salt & pepper over all the tomato slices. Make sure each tomato slice has a little bit of every ingredient. Place tomatoes into pre-heated oven on the middle rack. Roast for up to 1.5 hours or until the tomatoes begin to carmelize (see the “browning” in the picture). Check your tomatoes every 15 minutes. You can take them further than I did. It’s really a preference. Take the tomatoes out of the oven. Let them cool. Serve with any salad or by themselves. At my house I can’t keep them around at all. However, refrigerated they will keep well up to 1 week. Enjoy this weeks Tuesday Tip: a perfectly roasted tomato!